I could try to make a LUT, if needed. If you provide a corresponding set of frames from the two versions (BD vs preferred color) from a variety of scenes I could try to find a grade that works on the whole film. If it turns out that the color difference between the two versions is about the same from scene to scene I imagine that the result could be good. If not, there might need to be a set of different LUTs for different types of scenes. 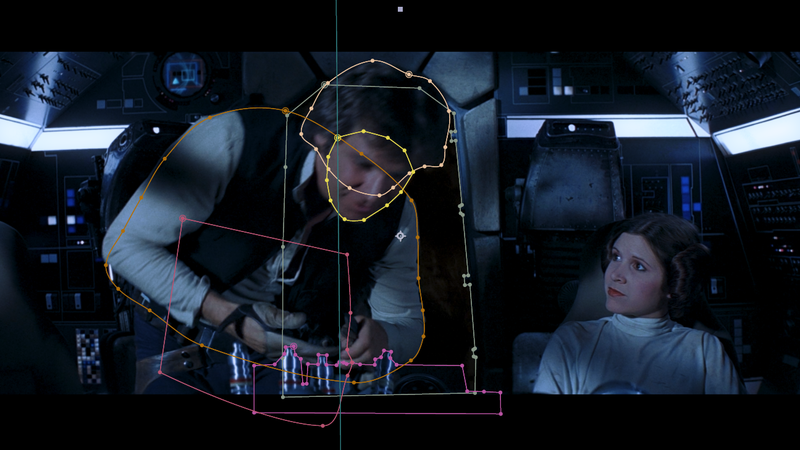 One thing I’d like to try is to take the image sets and lay out the frames from each version in a grid that represents a version of the whole film, and then try to match the BD grid to the target grid. I imagine that could be helpful when trying to adjust the whole film at once. The color grading/correction solution that I use does have a color match tool. The matching is not as advanced as Dre’s, but I think it could at least give me a decent starting point for further tweaking. Haha, you’re totally right, forgot that’s what that meant! I know the whole concept is to maintain suspension of disbelief by being meta about it, I just don’t feel like it fits within this story. Like, it can work in certain stories, but I don’t think lampshading is appropriate every time when it can be done, you know? Lampshading works really well in Marvel movies, since there’s always a wink to the audience as to the silliness of the situation, but I feel like Star Wars is more earnest than that. Are you planning to keep Han’s line? “How do we blow it up? There’s always a way to do that.” That could work as a more subtle nod to the previous Death Stars and the line might be funnier if they didn’t compare it to the Death Star already. It’s not perfect, but if you’re not looking for the change I think it’s fairly seamless. Nicely done. Do you think the lampshading of there being “another Death Star” isn’t needed? That’s something to consider. The current color is based on the color of the original hyperspace effect which I feel gives it a retro look, but I could add a bit of green to the highlights to match the new movies. Glad you like it! I agree that the color difference of the hallway adds depth. It’s a subtle effect and it takes a bit of extra work, but it helps to make the blue light look like it’s part of the scene rather than just a filter. What I still have to do is add the hyperspace tunnel in the windows, and mask the hallway in a later shot. Here’s a look at the coloring of the second scene. It takes a lot of masking to keep the hallway color untouched. Yeah, the sequels have very different visuals in many aspects. So I’m going for a look that fits with the older aesthetic rather than trying to make it look like it was made today. Yeah, now that this first scene has been “approved” I can try to achieve a similar look for the other scene. We’ll see what needs to be done. I think that looks perfectly fine, though I wonder if less would be more. Based on TFA, the hallway shouldn’t really look blue. I think it might do better to turn down the effect to split the difference between the parts of the frame that should and shouldn’t be bluish. I could turn down the blueness a bit. I actually did mask the hallway so it isn’t blue all the way in, there’s warmer light coming from further inside the ship. Here’s a comparison of the interior shot that follows the exterior shot, before and after my added hyperspace lighting. Thank you. I did add some blur and grain to make it look a bit more organic, maybe I can adjust it. It looks great. The one thing that I think could be improve is the ship’s movement. It starts out and then it feels like it decreases speed and settles in place towards the end. I feel like the speed could be more consistent. The original shot has a very similar movement, but I could tweak it a bit. The speed is actually consistent, but it feels faster when the ship is closer to the camera. Perhaps I could increase the speed a little bit toward the end. Here’s what I have for the exterior shot. I’ve tried to balance the look to be modern but not too modern. Style wise it’s TFA but the color is closer to ANH. I opted to replace the ship with a 3D model instead of rotoscoping the old ship (which had an error with the engine glow being in the wrong place), hopefully it doesn’t feel out of place. Thoughts? I did a little analysis of the TLJ score album and counted how many minutes of old themes are on the album (so it’s not the entire score, but I assume the full score has a similar old/new ratio). What I found was that there was less than 11 minutes of themes carried over from TFA, and just over 10 minutes of themes from the older movies. I didn’t count the title theme and the start of the end title music that are the same in all movies. That leaves over 1 hour of entirely new music, or about 74%. If the full score has a similar amount there might be about 1 hour and 45 minutes of new music. I think that’s pretty impressive considering that the score should use old themes for characters and things from earlier movies. Personally I’m a big fan of the TLJ score and the balance between old and new music works for me. I’m very excited to hear the score for IX. That’s actually really surprising to hear. I’ll have to watch TLJ again, because I could’ve sworn the old themes kept popping up every other time music was played. I’d also love to hear anybody’s thoughts on the main title score actually. The first note doesn’t feel as intense as the rest of the movies, but perhaps that’s more to do with a different orchestra playing than the first six? Or I’m a fool. I think the old themes do pop up a lot, but you probably pay extra attention when that happens (because you recognize it) and don’t notice the new music in the same way. Keeping an open mind is why I loved Solo (other than how dark most shots were). My main (likely only) concern for IX is John Williams’ score. I thought he did great in TFA, but I noticed a lot of repeating in TLJ that got me slightly annoyed by the music. I can’t think of a track in TLJ that originated there other than Luke walking out on Crait, but that was already used in the trailer, so I was already a little numb to it. But I’m down to discuss more once some IX stuff starts coming out. I sent you a PM for a download link, this looks absolutely incredible and i cant wait to watch it! Happy to hear that, however it’s not done. At the moment I’m helping Hal with one of his edits, but maybe I’ll have time to finish my edit later this year. 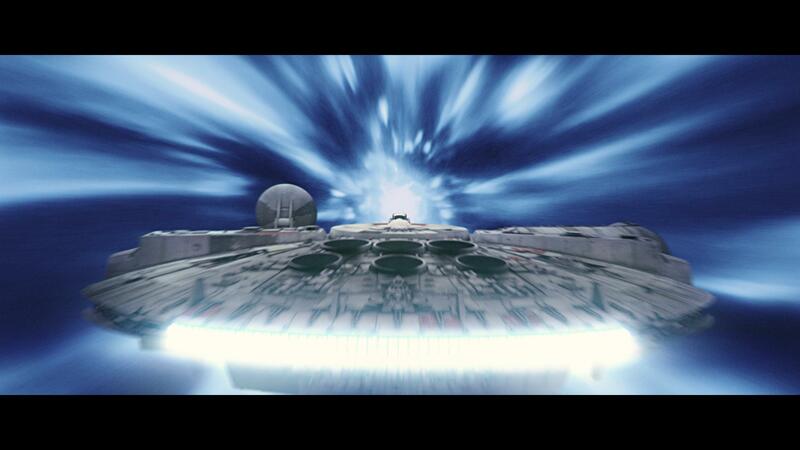 Managed to get a nice full screen hyperspace tunnel in a 6 second loop. I’ll upload the clip later as a resource. The next thing to do is to replace the existing tunnel in the exterior shot, I’ll post a progress picture once I get somewhere with that. 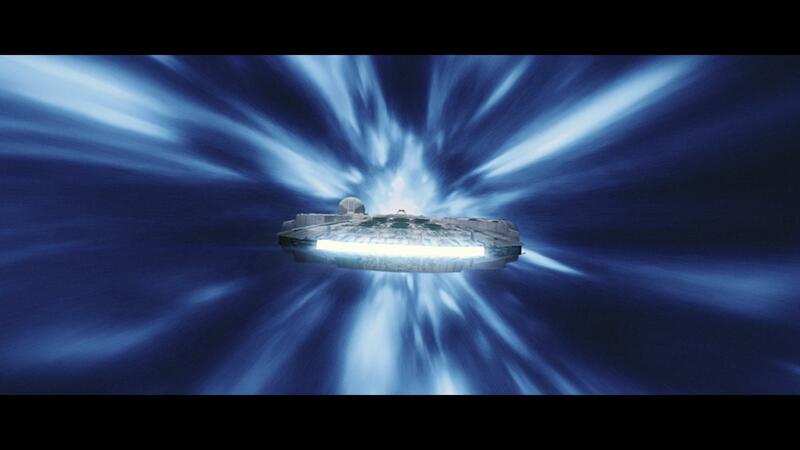 Currently working on getting a clean hyperspace tunnel from the Battlefront II cutscene. Going well so far. A Reylo type relationship required Kylo to be less evil in TFA and for Rey to join Kylo in TLJ. It’s infeasible to squeeze it into IX at this point with how the previous 2 films have been. Well, they almost joined in TLJ, but if the story as a whole is supposed to end with them together that can’t happen before the last movie. Romantic stories usually has some kind of trouble in the middle that is overcome by the end, so it could happen in IX. Of course Kylo has done some unforgivable things, but I would say things are pointing toward some kind of redemption in the end which would make a Reylo relationship of some kind more “okay” even though it is of course problematic in many ways. But that’s what makes it interesting as well, it’s not obvious what will happen and how it will be dealt with. Is that a shareable link? It says I have to request access. I just fixed the link. Here you are. Really interesting, he makes great points (mostly, a few are a bit far fetched). I agree that there is some kind of romance going on. Not sure what it will lead to in IX, but I wouldn’t mind a “Reylo” ending. It’s certainly a problematic relationship so it would probably not be a purely happy ending, perhaps bittersweet or even sad. We’ll see. I feel like she puts emphasis on Luke, they probably thought that Luke had the best chance of turning him away from the dark side. I don’t think training in itself would do that. I don’t know. I’m not sure if it matters though. I think the information in that line (whatever it implies) isn’t needed. And there being “Vader” in him is obvious anyway, Kylo is enough of a Vader Junior without it being spelled out. I think the line about Luke is implying it was their only hope to control his power and stop him from turning to the dark. The Vader line, at least in how I was using it in my dialog rearrangement, was a way for Han to express that it was a useless gesture to have Ben train with Luke, and that there is no saving him from this point forward. Ah, yeah I see. 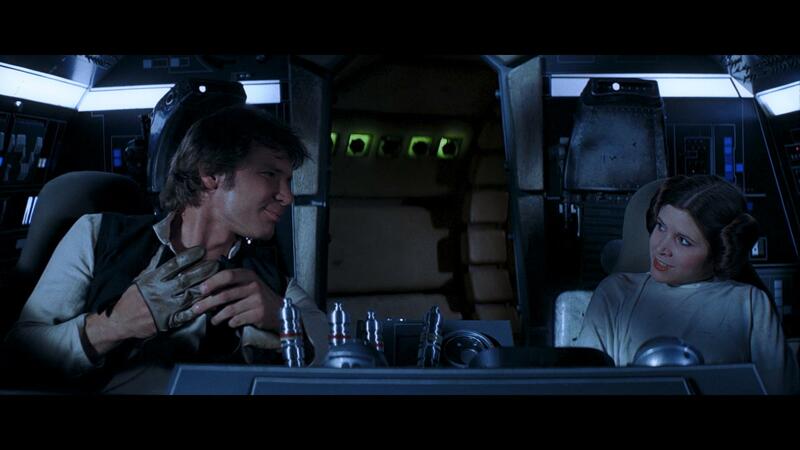 I don’t think it should seem like Han has completely given up on Ben though. I think Han giving up on ben and then later trying to redeem him when he sees him on SK base gives Han a more complex character arc than what he currently has. Whatever he says in that moment he has given up on Ben to some extent while Leia is more hopeful and tries to change his mind, I think moving a few lines there doesn’t really change his character arc. True, true. Thinking about it now I would probably leave those lines in there. As you say it discusses something integral to Ben’s story, and it’s good to be reminded of Luke’s role in it as well. Thank you for your input.